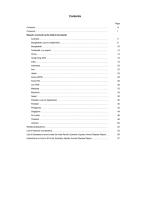 This report, the sixth in the series, contains information about the aquatic animal health status of twenty states in the Asia-Pacific region. The foreword discusses capacity building initiatives to improve disease surveillance in the region. 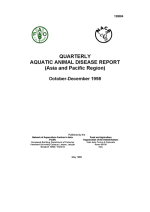 This report, the fifth in the series, contains information about the aquatic animal health status of eighteen states in the Asia-Pacific region. The foreword discusses improvements in the quality of reporting. This report, the fourth in the series, contains information about the aquatic animal health status of seventeen states in the Asia-Pacific region. 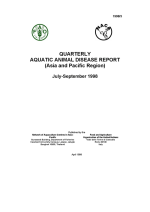 This report, the third in the series, contains information about the aquatic animal health status of seventeen states in the Asia-Pacific region. The foreword discusses improvements in the quality of reporting. 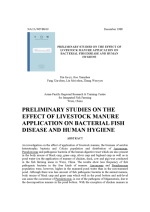 An investigation on the effect of application of livestock manure, the biomass of aerobic heterotrophic bacteria and Colicin population and distribution of Aeromonas, Pseudomonas and pathogenic bacteria of the human digestive tract which are also present in the body mucus of black carp, grass carp, silver carp and bighead carp as well as in pond water (on the application of manure of chicken, duck, cow and pig) was conducted in the fish farming areas in Wuxi, China. 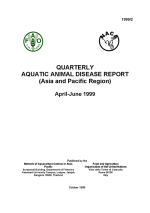 This report, the second in the series, contains information about the aquatic animal health status of fourteen states in the Asia-Pacific region. The foreword discusses the establishment of the regional disease reporting system. This report, the first in the series, contains information about the aquatic animal health status of thirteen states in the Asia-Pacific region. 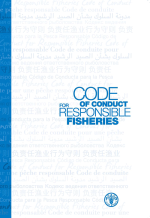 This document provides annotations to the Principles of Article 9 of the Code of Conduct for Responsible Fisheries. Given the diversity in aquaculture and the sometimes different perceptions of “sustainability”, more balanced and informed approaches are required to address developmental and environmental issues at any given location. Commitment for collaboration, constructive dialogues among responsible partners, and participation of aquafarmers and their communities are important when assigning responsibilities for sustainable development of aquaculture. 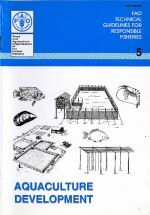 This Code sets out principles and international standards of behaviour for responsible practices with a view to ensuring the effective conservation, management and development of living aquatic resources, with due respect for the ecosystem and biodiversity. The Code recognises the nutritional, economic, social, environmental and cultural importance of fisheries and the interests of all those concerned with the fishery sector. The Code takes into account the biological characteristics of resources and their environment and the interests of other users. 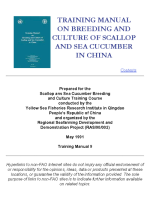 This training manual on scallop and sea cucumber hatchery and aquaculture techniques was prepared for the Scallop and Sea Cucumber Breeding and Culture Training Course, conducted by the Yellow Sea Fisheries Research Institute in Qindao, People’s Republic of China and organised by the Regional Seafarming Development and Demonstration Project in May 1991.